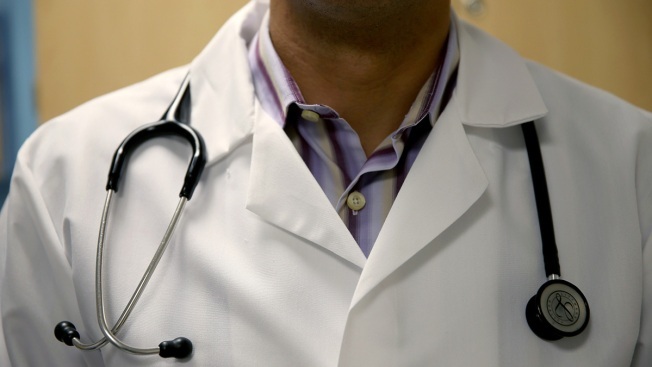 This June 2, 2014, file photo shows a doctor wearing a stethoscope. The Connecticut State Medical Society is taking a new stance on legislation that would allow terminally ill adult patients to receive medical aid in dying. After years of opposing the bill, citing the principles of the Hippocratic Oath, the organization's physicians and physicians-in-training have adopted a new policy they're calling "engaged neutrality." In written testimony submitted to the General Assembly's Public Health Committee, the society says "unanimity within the physician community on the physician's role during the transition from life to death no longer exists." The committee is holding a public hearing Monday on this year's aid-in-dying proposal. Opponents of the bill, including a Nevada physician and Connecticut disability rights activists, are planning a news conference before the hearing to warn against what they call the "dangers of legalizing assisted suicide."